Home Trades Could This Forgotten Tech Stock Be On The Road To Recovery? The tech sector can be very unforgiving. A tech product is generally only good until the crowd finds more interesting technology to buy or obsess over. Think of how often Apple (NASDAQ: AAPL) releases new iPhones. Sometimes, there isn’t a substantial difference between iPhone models, but the company is constantly pushing its latest tech. That’s because management knows buyers will get bored and move elsewhere unless there are new features added on a frequent basis. There’s no better example of this situation than with Zynga(NASDAQ: ZNGA). The company became incredibly popular with its FarmVille game on Facebook. Games like Words With Friends also have done quite well on mobile platforms. However, by the time the company had its IPO, it was already starting to lose momentum. The new games could not attract customers like they used to. There were a lot more competitors in the mobile space, and that’s where all the casual gaming was taking place (as opposed to social media platforms). 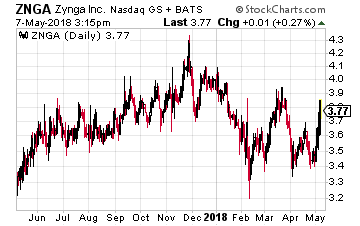 ZNGA’s stock soon dropped below its $10 IPO price and hasn’t been back there since. Today, the stock is trading under $4 a share. However, this last quarter, ZNGA surprised investors with increases in both mobile users and mobile revenues. The company also announced a new $200 million share buyback. And, it appears the company’s aggressive acquisition strategy has been paying off. As you can see from the chart, the stock jumped over 3% on the news. For longer-term investors, the real action in ZNGA happened in the options market. That’s where you can find a couple very large bullish trades. In September options, a buyer grabbed 8,600 of the 4 calls for $0.25 (for a breakeven point of $4.25, stock at $3.80). Going farther out, someone also bought over 1,200 of the January 2019 calls, also at the 4 strike, for $0.41 (breaking even at $4.41, stock at $3.60). Straight call purchases like these are about as bullish as you can be on a stock, especially when you are buying that much time. Of course, since the stock is so cheap, longer-term calls don’t cost all that much. The other benefit is since the stock is at such a low price, there isn’t a whole lot of downside left for short sellers. As long as the company stays in business, it essentially has only one direction it can go. The mobile video gaming space is enormous, and there’s still plenty of room for ZNGA to make a splash – particularly if it continues to make shrewd acquisitions. As such, I think either one of these trades I mentioned above is a reasonable, cheap way to get long the stock. While the stock isn’t like to go back to $10 anytime soon, it won’t take a big move for these calls to pay off.